10% Discount for all Military! The Sand Dollar is a perfect celebration of life along the coast, thanks to a stellar location that’s just a shell’s throw away from the blue ocean waves. Located just steps away from the beach in the heart of Kill Devil Hills, visitors won’t have to travel too far to get sand between their toes at this pristine 2 bedroom, 2 bathroom oceanfront condo. The beach certainly steals the scene at this sweet condominium complex, and the direct beach access is a major lure for water lovers. However, if you can tear yourself away from the adjacent beach, you’ll find a bevy of entertainment options and amenities right outside your door, including a community pool, a convenient elevator, and a locale that’s close to a wealth of the central Outer Banks’ top attractions. The interior of The Sand Dollar is just as enticing as that stretch of sand waiting just outside, with bright pops of blue in a rainbow of hues, and cool wooden furnishings and pieces of décor. The overall atmosphere perfectly complements those ocean views, which are abundant and are perfectly framed by a wall of windows in the sunny living and dining areas. Step outside to the deck to take in the sea breeze, or enjoy a casual ocean sunrise from the breakfast bar which borders the ample kitchen. There’s also two bedrooms nearby, which are tastefully appointed, and which are both perfect respites for relaxing after a long day at the shore. 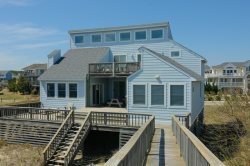 Featuring a prime location where the oceanfront views and beach access are second-to-none, The Sand Dollar is a gem of a find for Outer Banks fans who can’t get enough of the seashore. Perfectly accommodating both inside and out, this sweet vacation rental will be a favorite retreat for elite coastal lovers and inherent would-be beach bums alike. Mini-Vacations: Can’t get away for a whole week? Please consider one of our "Mini-Vacations." The Sand Dollar gladly accepts stays shorter than a week (three-night minimum stay required). Need more than one unit?Additional Seaside Vacations homes in the same complex: TSC203, TSC301, TSC305 & TSC404.